Prefilled syringes provide considerable benefit to anesthesia professionals including sterility, convenience, affordability, and perceived safety.1 At our institution, we use syringes from multiple manufacturers and have realized several of the benefits above. Here, however, we report a pair of “no-read” medication administration errors related to prefilled syringes of phenylephrine and succinylcholine manufactured by Nephron Pharmaceuticals Corporation (Columbia, SC). The first event involved a patient accidentally receiving 40 mg of intravenous (IV) succinylcholine for hypotension during the process of moving to the operating room table. The patient suffered no apparent long-term consequences, but became apneic and was paralyzed without anesthesia. Following a department-wide Morbidity and Mortality conference shortly after this event, another patient was accidentally administered IV 480 mcg (6 ml) phenylephrine after induction of anesthesia instead of 120 mg (6 ml) succinylcholine. No-read errors are primarily the responsibility of the care provider team. However, we determined that the specific packaging of the syringes and the associated potentially dangerous visual similarity of the specific products may also contribute to the drug error (Figures 1a and 1b). The present syringes meet the ASTM standards, but the lack of circumferential red color around the succinylcholine syringe may lead to accidental administration of a paralytic.2 To address this present issue, our pharmacy placed a paper label on the succinylcholine syringes. However, this negates the purpose of purchasing prefilled and pre-labeled syringes. In addition, it may create new threats of drug error and associated morbidity. Figure 1a: Front, 1b: Reverse: original syringes of phenylephrine (top) and succinylcholine (bottom). Note lack of circumferential red coloration on succinylcholine, reducing visual discrimination of commonly used syringes. Figure 2a: Front, 2b: Reverse: redesigned syringes with different barrel color and circumferential red band. The authors partnered with the APSF and Nephron Pharmaceuticals, who efficiently acknowledged the problem and created new labels (see Figures 2a and 2b) that we believe will help prevent this pattern of drug administration errors. We appreciate the support and ethos that APSF provided to our concern and the responsiveness by Nephron Pharmaceuticals. Neither author has any relevant disclosures related to the content of this letter. Makwana S, Basu B, Makasana Y, et al. Prefilled syringes: An innovation in parenteral packaging. International Journal of Pharmaceutical Investigation 2011;1:200-206. Nephron Pharmaceuticals is a firm with over 20 years of sterile pharmaceutical manufacturing experience. 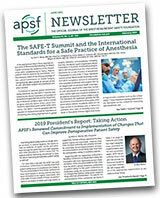 We appreciate the work of Dr. Hand, Dr. Cancellaro, and APSF Editor-in-Chief, Dr. Greenberg. Our syringe labels were enhanced using our in-house digital printing press, and quickly deployed to the entire US hospital market. As a market leader in prefilled syringes for anesthesia use in US hospitals, the Nephron CGMP quality team continuously monitors all aspects of product quality. We welcome input from the dedicated professionals working with APSF. Dear SIRS refers to the Safety Information Response System. The purpose of this column is to allow expeditious communication of technology-related safety concerns raised by our readers, with input and responses from manufacturers and industry representatives. Dr. Jeffrey Feldman, current chair of the Committee on Technology, is overseeing the column and coordinating the readers’ inquiries and the responses from industry. The information provided is for safety-related educational purposes only, and does not constitute medical or legal advice. Individual or group responses are only commentary, provided for purposes of education or discussion, and are neither statements of advice nor the opinions of APSF. It is not the intention of APSF to provide specific medical or legal advice or to endorse any specific views or recommendations in response to the inquiries posted. In no event shall APSF be responsible or liable, directly or indirectly, for any damage or loss caused or alleged to be caused by or in connection with the reliance on any such information.